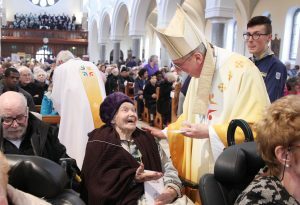 The Church of St Agnes in Crumlin was packed on Sunday for Dublin’s diocesan celebration of World Day of the Sick, which is held each year on the Sunday nearest to the Feast of Our Lady of Lourdes, which this year happened to be on the feast day itself, 11 February. Those unversed in the practice of our faith might be surprised at what a joyous occasion it was, but as Archbishop Diarmuid Martin reminded the congregation, “the Church has followed in the path of Jesus himself to be a place where the sick are welcomed, surrounded and comforted by the prayers and the support of all”. Indeed, Our Lord’s good example was to be found in Mark’s account of the healing of the leper in yesterday’s Gospel reading. Yesterday’s Sunday Gospel teaches us a little about how we are called to live out the message of Jesus in today’s society, said Archbishop Martin. “It shows us a Jesus who lived within the cultural realities of his time and was respectful of them. He told the leper who was cleaned scrupulously to observe all the rituals required by the law. “Jesus fulfils the norms but he also does things that shock the good synagogue-going believers of his time. He has no difficulty in encountering a person, who it was considered someone to be avoided as unclean, but who Jesus sees simply as a person needing healing. Jesus goes out to meet us today just as we are. He does not categorise people or consider certain lives as more worthy of care than others. In his homily, the Archbishop said that there was a temptation for all in the Church, especially for those in leadership, to “become fossilised in our religious identity and devotion and practices”. This was contrary to “allowing our faith to free us from inhibitions and to witness with courage to the joy that our belief brings us”. “Catholics can become timid about speaking of their belief,” he said. “When that happens, our timidity means that we banish Jesus, to paraphrase the final part of our Gospel reading, ‘outside in places where nobody lives’. “The message of Jesus belongs precisely where people live, especially where people live in anguish and emptiness. “We invoke now the healing power of Jesus on the sick among us, remembering in our prayers all those who suffer sickness or anguish or addiction or pain or isolation and loneliness.